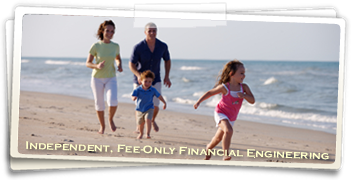 On Target Wealth Partners is an independent, fee-only financial consulting firm. Clients receive unbiased financial advisory services in the form of disciplined investment management grounded in academic research and goal-oriented financial planning. We call it financial engineering. All solutions are personalized and customized to each client’s unique circumstances and their desire and ability to take on risk. On Target Wealth Partners’ investment philosophy is based on efficient markets and the all-important relationship of risk and return. Client portfolios are globally diversified and tax efficient through the implementation of institutional class index funds. Long term returns are driven predominantly by a complementary and appropriate asset allocation. As a Registered Investment Advisor firm, On Target Wealth Partners maintains a fiduciary standard to act in the client’s best interest at all times. By providing clients a fact-based, conflict-free alternative to traditional advisory services that often employ active management speculation, market timing or stock picking strategies, On Target Wealth Partners positions itself as a principle-focused firm that clearly places clients and their corresponding financial success first and foremost in its ongoing mission. Besides seeking long term financial success for all clients, On Target Wealth Partners also seek to make the planning process more enjoyable. With a greater understanding of how markets work and why On Target Wealth Partner’s wealth management plan will assist in achieving communicated goals, clients can relax, enjoy life, and let the investment process work for them…even in times of market decline or high volatility.